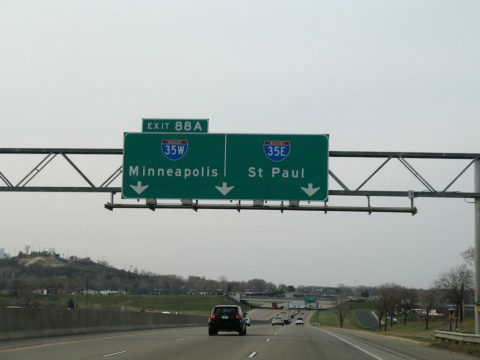 Interstate 35 splits into Interstates 35E and 35W to serve St. Paul (east) and Minneapolis (west). The two split at Burnsville in the south suburbs, with I-35W leading north to Bloomington and Richfield and I-35E angling northeast through Apple Valley, Eagan and Mendota Heights. 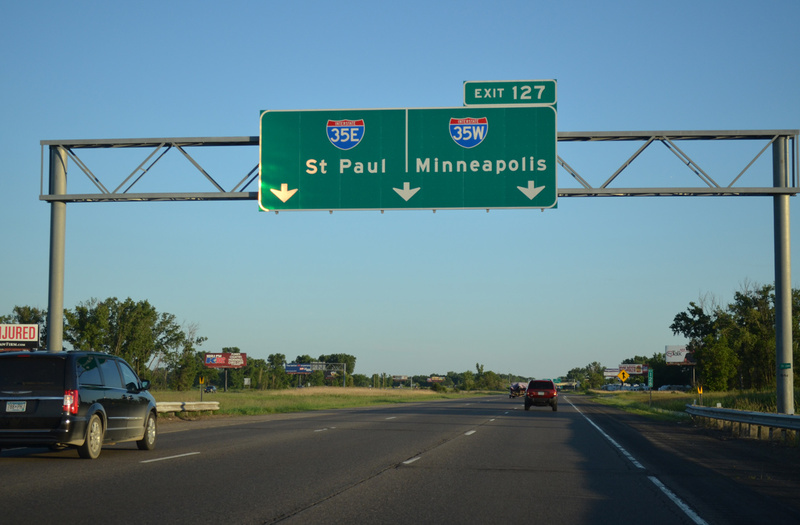 I-35W includes a High Occupancy Toll (HOT) lane in both directions from the split with I-35E northward to the interchange with Minnesota 65 and Interstate 94 at Downtown Minneapolis. 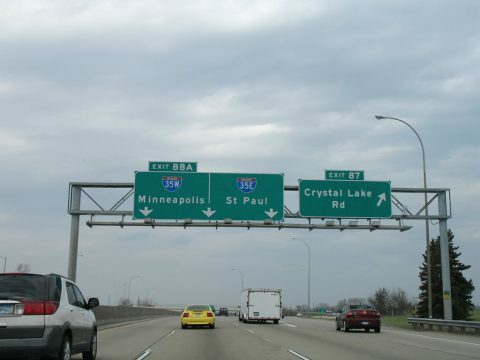 The freeway sees two east-west segments, one along side Minnesota 62 (Crosstown Highway) and another parallel to I-94 on the south side of the Minneapolis central business district. 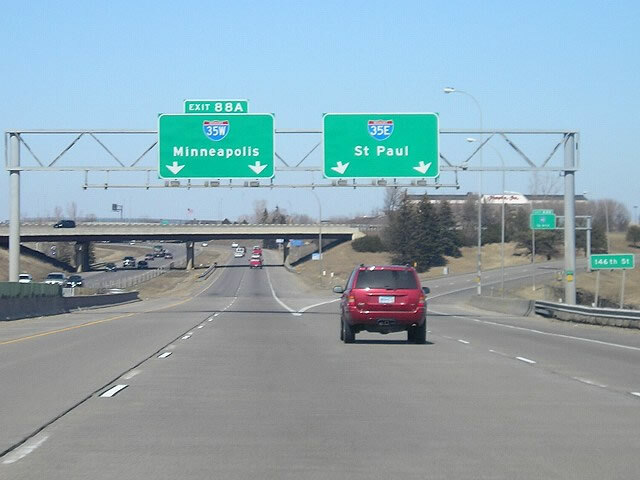 Beyond the separation with I-94, Interstate 35W branches northeasterly, first crossing the Mississippi River on the St. Anthony Falls Bridge and then turning east to Roseville and the west end of Minnesota 36, a freeway extending east to Maplewood. North from there, I-35W straddles the New Brighton and Arden Hills city line to Mounds View and Shoreview. U.S. 10 briefly ties into the freeway along this stretch. I-35W curves easterly again at Blaine to Lino Lakes. 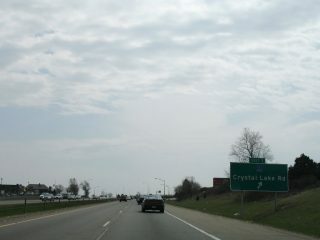 The freeway traverses an area of wetlands from Rice Lake Chain of Lakes Regional Park Preserve to Peltier and Rondeau Lakes to recombine with Interstate 35E at a wye interchange in south Columbus. 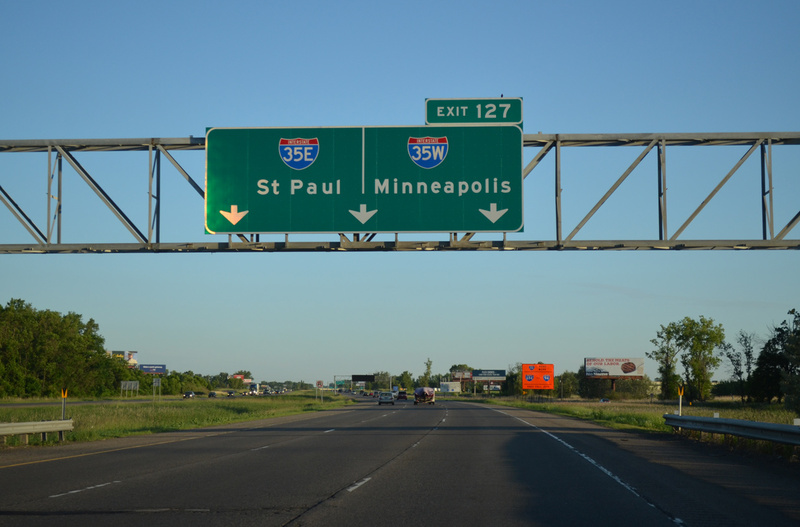 Interstate 35W parallels historic U.S. 65 north from Burnsville to Downtown Minneapolis and old U.S. 8 from Minneapolis north to Columbus. 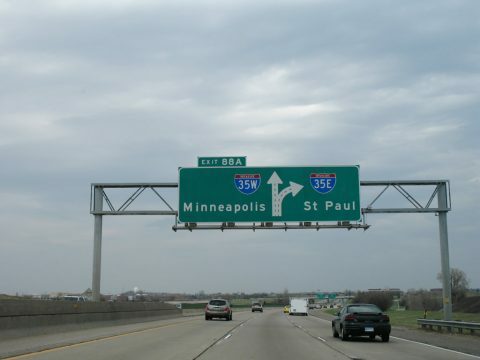 Minnesota 36 provided the link between the two sections of Interstate 35W between Hennepin Avenue and New Brighton Boulevard (U.S. 8) until the freeway was completed. The interchange with I-335, a planned east-west connector to I-94, held up completion of this section until it was canceled in 1975. The former northbound view of Interstate 35W across the former Mississippi River bridge. Photo taken 04/23/07. The Interstate 35W bridge over the Mississippi River collapsed during the peak traffic hours of August 1, 2007, near Downtown Minneapolis. Without any notice, the deck truss bridge (built in 1964, opened in 1967, 1907 feet long, 14 spans) plummeted into the waters of the Mississippi River some 64 feet below, sending drivers and their vehicles into the river in an instant.1 A total of 111 vehicles were on the portion of bridge that collapsed; 13 people died and 145 people were injured in the tragedy. Inadequate load capacity of the gusset plates (support elements along the under side of the bridge) failed, causing the bridge collapse to occur. An in depth report from the NTSB on the event is available here. A $15-million contract to remove the bridge debris was awarded to Carl Bolander & Sons Co. on August 8, 2007. Crews used three cranes to lift the bridge deck segments for their move to a staging area for analysis by NTSB officials. 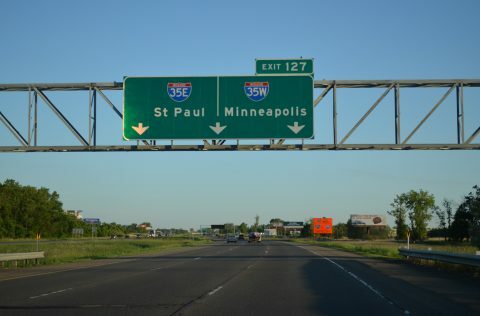 During this period without the crossing, commuters were directed on Interstate 94 and Minnesota 280 to circumvent the bridge area of Interstate 35W. MnDOT blocked Minnesota 280’s intersections with County Road B, Broadway Street N.E., Walnut Street and Roselawn Avenue in an effort to temporarily upgrade all of Minnesota 280 into a full freeway (Minnesota 280 existed previously as a freeway halfway between Interstates 94 and 35W). The replacement span opened well ahead of schedule on September 18, 2008 and carries ten overall lanes of traffic. Named the St. Anthony Falls Bridge, the span is 189 feet wide, 76 feet wider than the original span, and includes both full inside and outside shoulders. 1961 – I-35W was open from a point north of Minnesota 13 at Burnsville to the Lyndale Connector (then U.S. 65). 1965 – I-35W under construction southward from MN 13 to I-35 at Burnsville and northward from the Lyndale Connector to Lake Street. 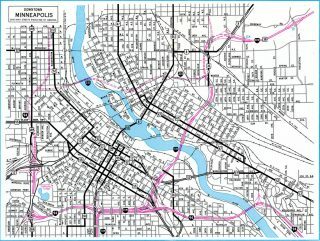 1968 – open from Burnsville (I-35) north to I-94 and Downtown Minneapolis and from Minnesota 208 (Exit 23A) north to County Road H (Exit 28C) at Mounds View. Fall 1968 – I-35W extended north from Mounds View to Lake Drive (then U.S. 8) at Lino Lakes. 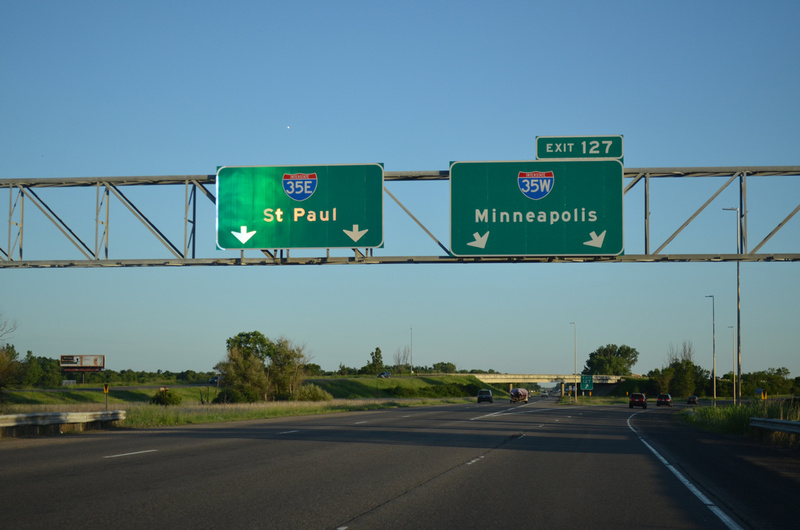 I-35E and I-94 side by side section through Downtown Minneapolis also completed. 1969 – Mississippi River Bridge north of Downtown Minneapolis. 1970 – Interstate 35W complete between Lake Drive in Lino Lakes to I-35 at Columbus. 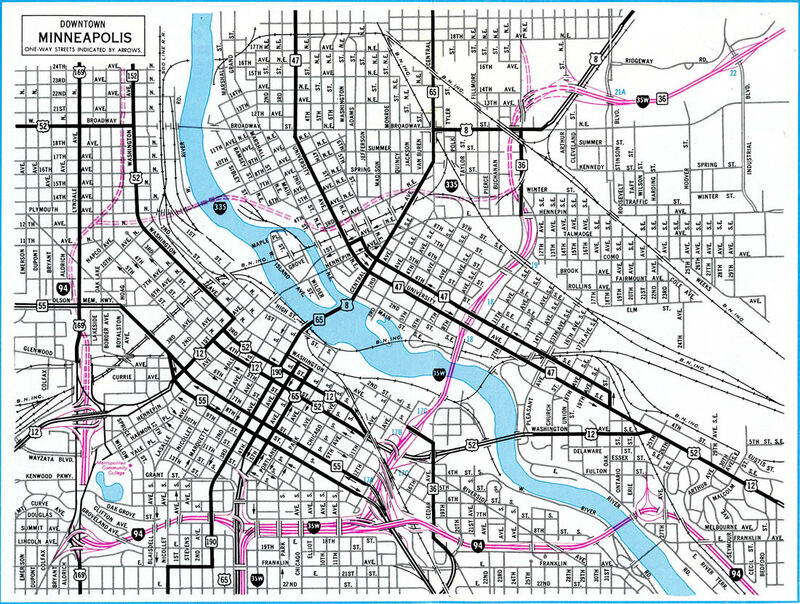 1973 – I-35W extended south from the Mississippi River Bridge to I-94 and north to Hennepin Avenue (Exit 19). 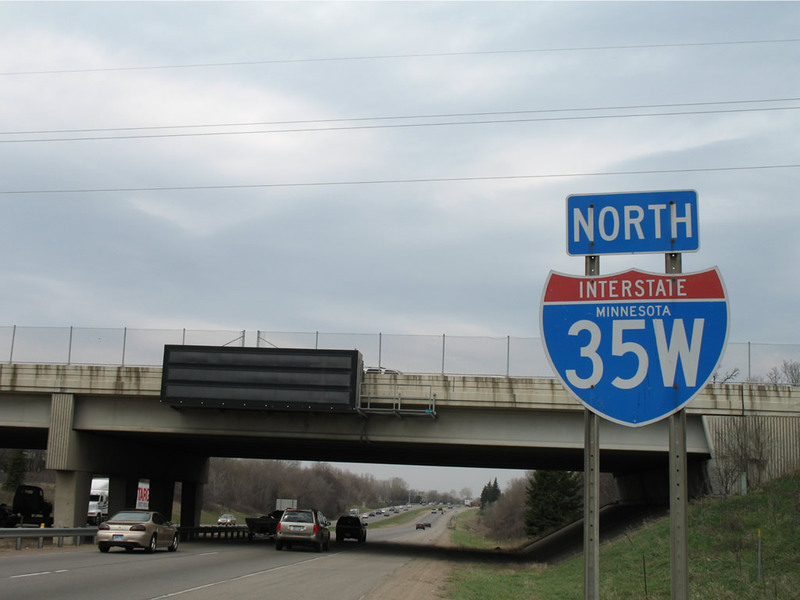 The north section of I-35W opened west to New Brighton Boulevard (then U.S. 8) and cosigned as Minnesota 36. 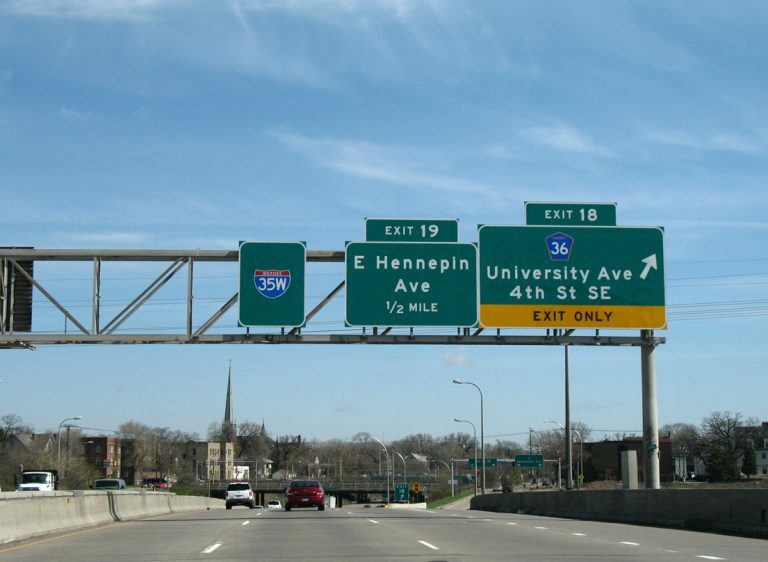 1976 – Interstate 35W completed overall with the section between Hennepin Avenue and New Brighton Boulevard opened. 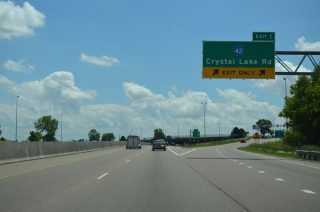 The interchange along this segment with I-335 dropped as the route was canceled. Most of these conversions were completed during the 1960s and 1970s. The Western Interstate 84 was among the last, as it was converted by 1980. However, there were two exceptions remaining in the system: Interstate 35 splits twice into Interstate 35E and Interstate 35W, once in the Dallas/Fort Worth metro area and again in the Minneapolis/St. Paul metro area. The reason these split routes still remain is that neither city wanted to relinquish the routing of Interstate 35. 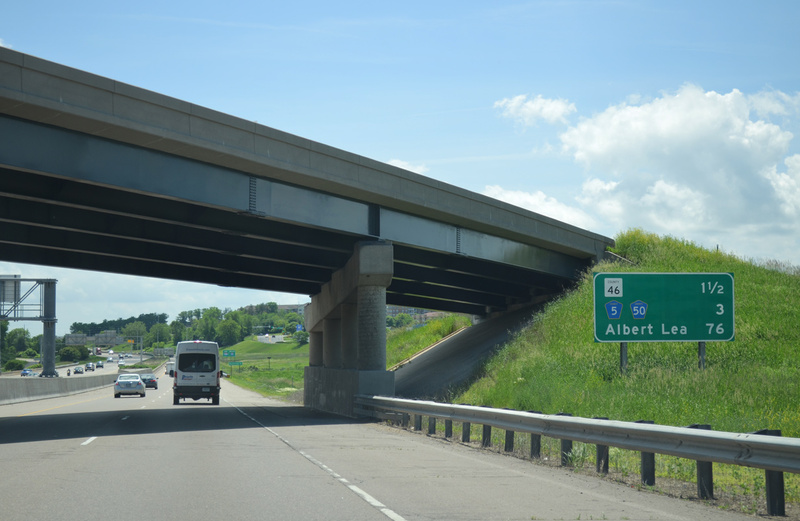 AASHTO conceded and the split suffixed routing remains in both Texas and Minnesota. A new set of split routes appeared in 2013 when Interstates 69C and 69E were established in South Texas by an act of Congress. The circumvented the authority of AASHTO and the mandate that no new suffixed routes be designated. 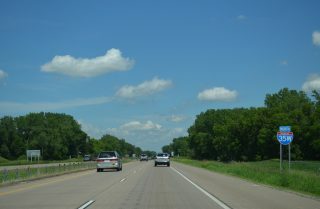 Interstate 69W was established a year later. 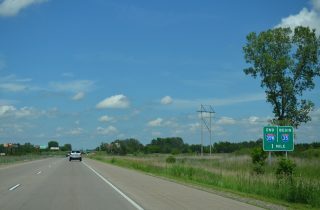 The final reassurance shield for Interstate 35W stands beyond Anoka County Road 23 east of Peltier Lake. Photo taken 06/14/15. An end sign precedes the merge of Interstate 35W with I-35E by one mile. The two freeways combine in southeast Columbus along a rural stretch with a 70 mile per hour speed limit. First photo taken 06/14/15; second by Jeff Morrison (03/19/07). West Freeway Drive (CR 21) crosses I-35W just ahead of the wye interchange with I-35E. 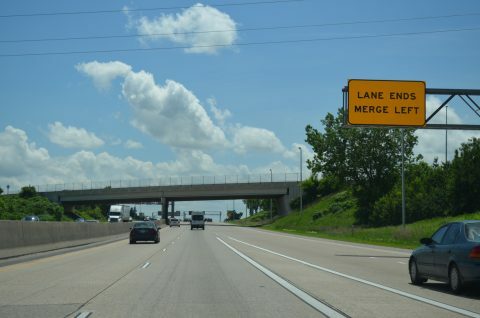 A lane drop coincides with the left side merge preceding a truck weigh station. Photo taken 06/14/15. The roadways of Interstate 35E separate to accommodate the sweeping on-ramp of I-35W north. Duluth lies 129 miles to the north via I-35. Photo taken 06/14/15. 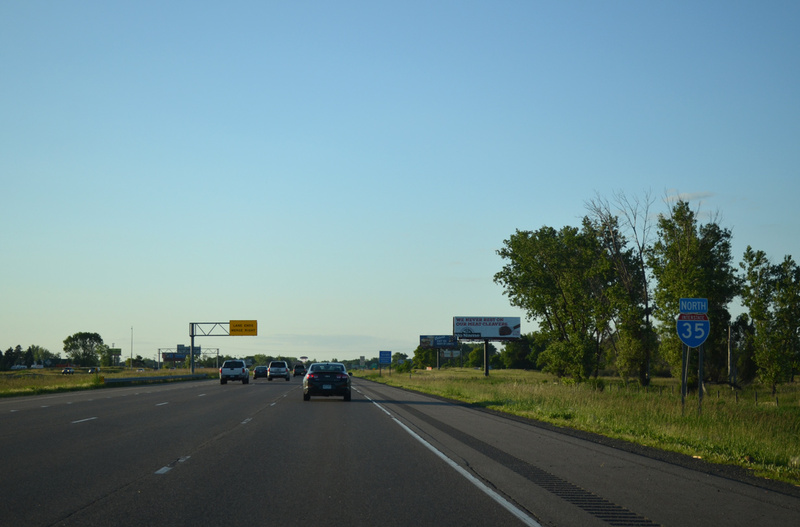 Interstate 35 advances north from the merge of I-35E/W with six overall lanes to U.S. 8 (Exit 132) at Forest Lake. Photo taken 06/15/15. Passing between Clear and Mud Lakes in Forest Lake, Interstate 35 is three miles out from the I-35E-W separation. Photo taken 04/23/07. Advancing south from the interchange with Minnesota 97 (Exit 129), the first in a series of signs outlines the forthcoming split of Interstates 35E-W south. Photo taken 06/15/15. The right lanes of I-35 south connect with Interstate 35W southwest to Minneapolis, and the left lanes progress southward on Interstate 35E to the capital city. A truck restriction is in place for through trucks on I-35E due to the parkway section south of Downtown St. Paul. Photo taken 06/15/15. 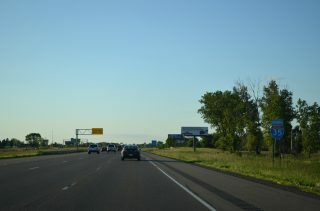 I-35W turns west from the separation at Exit 127 through Lino Lakes to Blaine, Mounds View, Arden Hills and New Brighton. 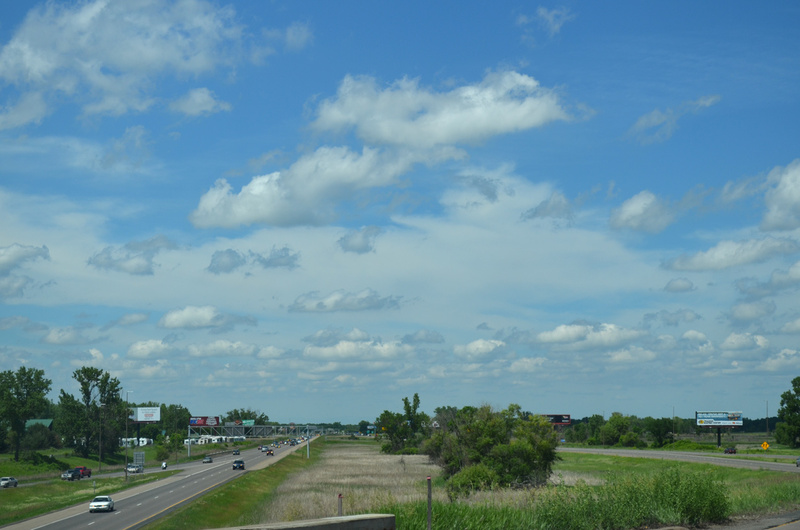 I-35E ventures south to Centerville, White Bear Lake, Vadnais Heights and Little Canada. Photo taken 06/15/15. Interstate 35W south at CR 42 (Crystal Lake Road) before expansion of the freeway with inside shoulders and widening of Exit 1 to two lanes. Photo taken 04/21/07. 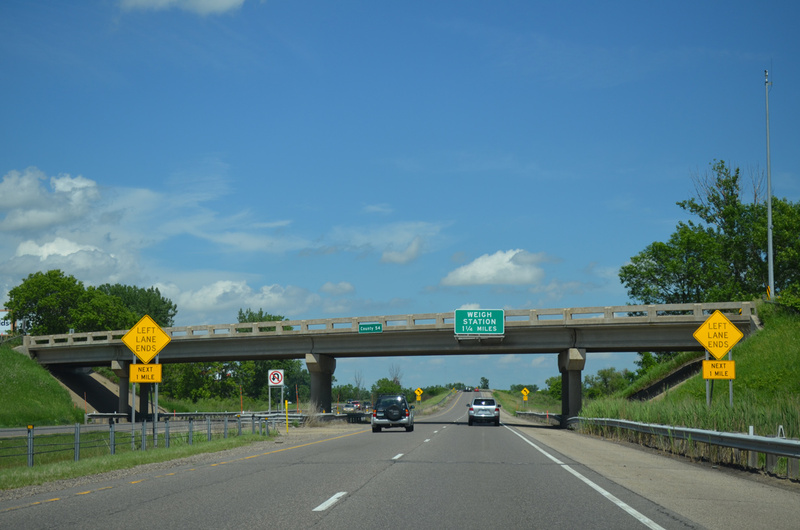 A half diamond interchange (Exit 1) joins Interstate 35W with County Road 42 by Burnsville Center mall just north of the merge with I-35E. Photo taken 06/14/15. 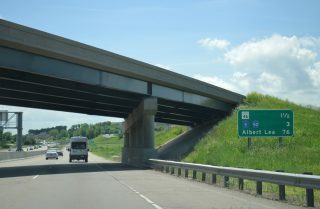 The southbound lanes of I-35E pass over Interstate 35W by an interchange sequence sign outlining the succeeding exits from I-35 south through Lakeville and Albert Lea (I-90). Photo taken 06/14/15. Interstate 35W crosses over Southcross Drive just ahead of the merge with the I-35E on-ramp. 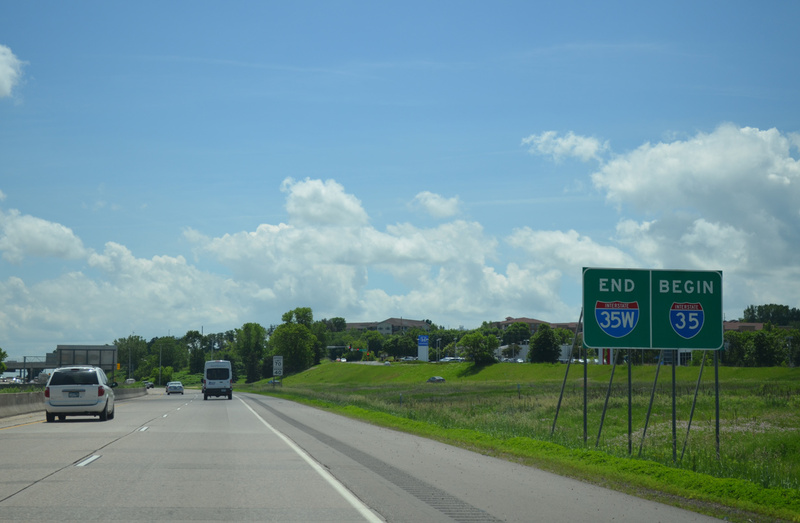 An end sign marks the transitions back into Interstate 35 south. Photo taken 06/14/15. 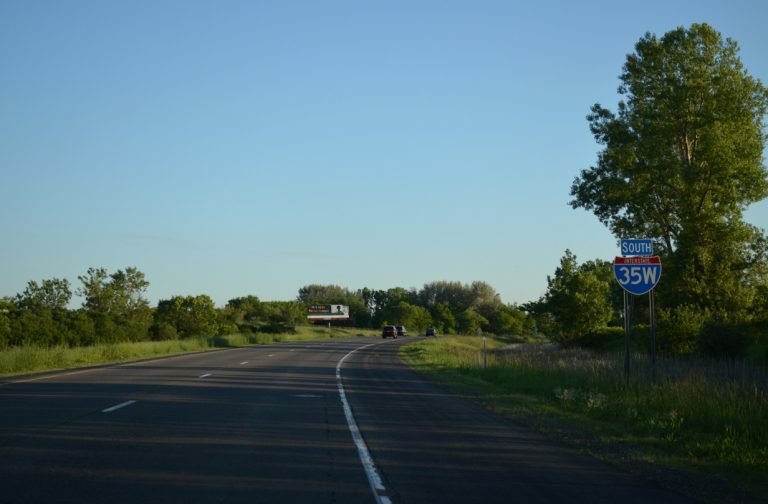 Interstate 35 advances southward with three lanes toward Exit 86 with County Road 46 beyond the lane drop at the Crystal Lake Road. Photo taken 06/14/15. 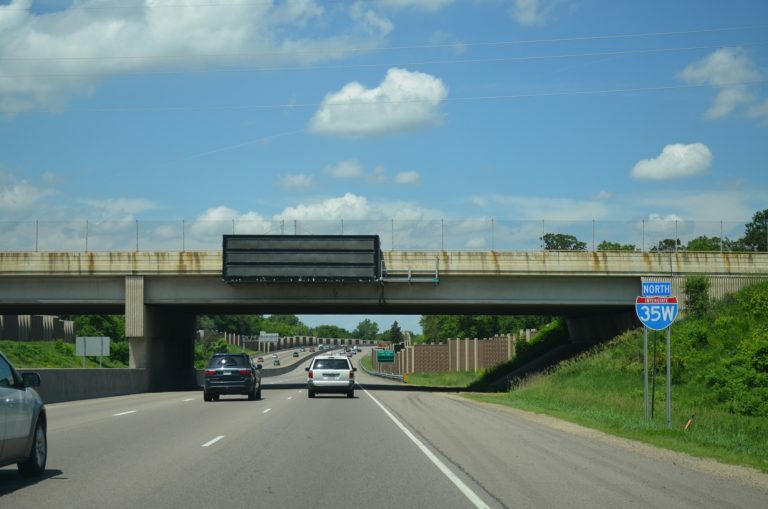 This initial set of overheads for Interstates 35E-W was replaced by 2011, with the Exit 88A tab shifted to the left for I-35W north. A bus-only ramp was added to the freeway northbound here. Photo taken 04/20/07. 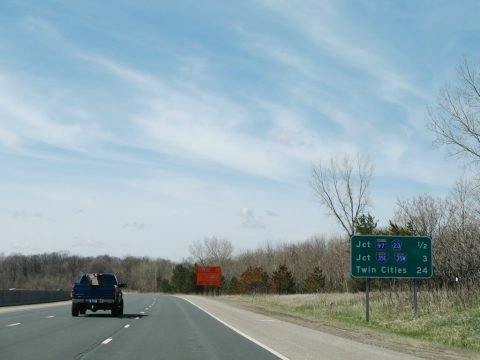 This set of signs at Exit 87 was vastly carbon copied by 2011, but with exit tabs shifted to the left and right respectively and lighting fixtures removed. Photo taken 04/21/07. 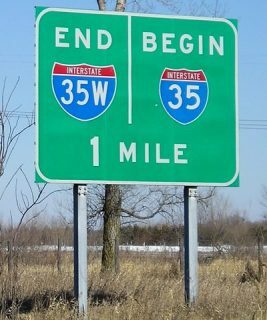 Former I-35E and I-35W diagrammatic sign posted just north of the Crystal Lake Road overpass. Photo taken 04/21/07. Replaced guide signs at the wye interchange (Exit 88A) where Interstates 35E/W partition in Burnsville. Photo taken by Jeff Morrison (03/19/07). The first shield for Interstate 35W appears at the McAndrews Road over crossing, north of the half diamond interchange with County Road 42. Photo taken 06/14/15. Page updated March 17, 2019.